The Nigerian navy is ill-equipped to tackle the growing problem with piracy. Nigerian piracy is unique for several reasons. It accounts for 71% percent of all incidents in West Africa, and the methods used by Nigerian pirates are highly profitable. The International Maritime Bureau (IMB), which monitors sea crime, reported eight piracy incidents off Somalia during the first half of 2013. 31 piracy incidents were recorded off the West African coast during the same period, 9 off the coast of Nigeria and 22 outside of Nigeria’s territorial waters. With fewer attacks off Somalia, attention has moved to the Gulf of Guinea, a hot spot for violent piracy and ship hijacking for many years. The region recorded more than 40 piracy attacks in the first three quarters of 2013, with 132 crew taken hostage and seven vessels hijacked – six tankers and an offshore supply vessel. Nigeria, the main source of piracy in the region, accounted for 29 piracy incidents, including two hijackings, 11 ships boarded, 13 vessels fired upon, and three attempted attacks. Unlike the waters off Somalia and the Horn of Africa, through which ships now speed with armed guards on board, many vessels have to anchor to do business off West African countries with little protection. Indeed, pirates in Nigeria and in the Gulf of Guinea have different methods, different motives and stronger political connections. Piracy off the Nigerian coast usually consists of the hijacking of a product tanker and the transfer of the cargo into another vessel. This is a highly profitable operation that takes several days. According to the U.N. Office on Drugs and Crime, simple robberies bring in about $10,000 to $15,000 per attack “” potentially amounting to $1.3 million annually in recent years. Another target is oil, which accounts for 80 percent of Nigeria’s budgetary revenue. It could generate as much as $30 million per year for pirates and militants. Thus, piracy in the Nigeria is more focused on stealing cargo, and the seafarers are largely seen as an obstacle to piracy operations. Seafarers kidnapped in the Gulf of Aden spend an average of 11 months in captivity compared to an average of four days for those kidnapped in the Nigerian case. Levels of violence are more difficult to compare. Some experts have linked a recent increase in attacks on shipping to Nigeria’s elections scheduled for February 2015. This might be directly linked to Nigeria’s other endemic issue; corruption. Nigerian politicians are accused of covering up and protecting pirates in exchange for a cut of their revenue, which is then used to finance election campaigns. While pirates’ profits remain high, the political will to tackle piracy is low. Given the growing Boko Haram threat, commitment of state resources to combat piracy remains a low priority. 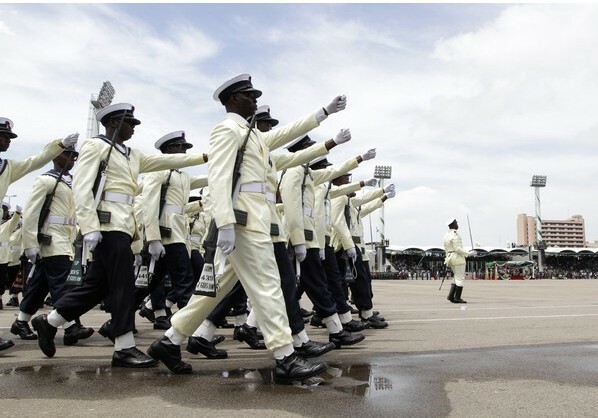 Fighting Nigerian piracy will likely be harder than the Somali gangs, despite the fact that the country’s new navy chief has pledged to tackle the problem. The European Union, which imports more oil than anyone else from the region, now has its anti-piracy program with regional states up to cruising speed; the idea is to bolster law-enforcement abilities with investment in coast guards. The U.S. Marine Corps also has a rapid-response team based in Spain that could be used to respond to piracy off West Africa. China, which is the biggest single importer of sub-Saharan crude, made major steps in its naval operations in 2008 when it sent ships halfway around the world to fight Somali pirates in the Gulf of Aden. That on-going deployment is seen as a crucial proving ground for China’s hopes of creating a blue-water navy. But despite China’s reliance on crude from the region, especially from Angola, there’s little chance of another Chinese anti-piracy task force heading for the Gulf of Guinea. Somali piracy, in other words, may be coming to an end. West African piracy may just be getting going. Yiannis is a Researcher and Consultant on Islam in Africa and Terrorism Issues.